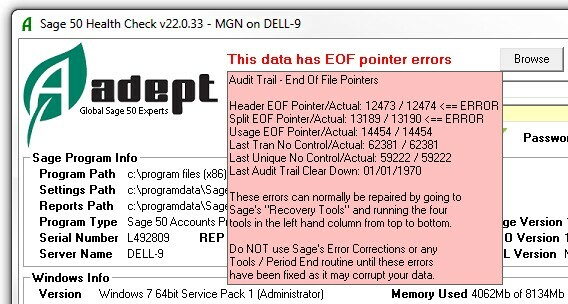 This free Add-On from the Adept Tools range will perform some key diagnostic tests on your Sage 50 accounting system. It includes a speed test that is ideal for checking how well your Network is performing with your Sage data files plus a Linkage Corruption test for the Invoice, SOP & POP modules. Displays the Sage Program Type and the Serial Number. Displays the Sage Program Version, SBDDestop Version and SDO Version. This is just 1 of many fantastic Add-Ons that Adept have for Sage 50 & 50cloud Accounts, click here to see more!